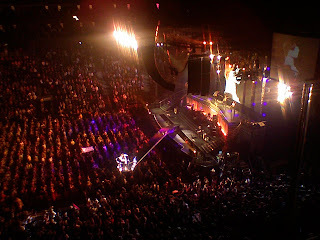 I doubt either of these will end up being chosen as the "best" pictures from Tina's concert in Newark, NJ on Wed, Nov 26, but the fact that they were taken from mid-way up in the second tier with my no-frills cell phone is somewhat impressive, no? Plus we had to travel from NYC to Newark on the busiest holiday travel day of the year -- during rush hour -- after a terrorist threat completely shut down NJ Transit and Amtrak (luckily we were able to take the Path train and made it just in time). Maybe that will earn us an extra mercy point or two? And if the contest is graded on any sort of curve, well, I feel luckier already. 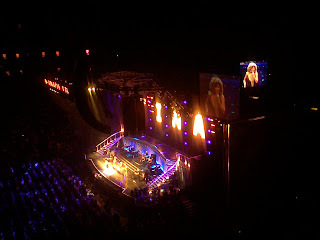 :)But seriously, this was my very first time seeing Tina perform live, and the concert was every bit as spectacular as I had imagined -- perhaps even more so! So please go ahead and check out the attached pics -- the first of which was taken during "Proud Mary," and the second during the amazing finale of "Nutbush City Limits" -- and see what you think. In related news, my friend and I were quite curious as to why Tina performs with a corded mic during most of the concert. Is there a story behind that, or is she just an old-fashioned kinda gal who feels more comfortable having that rope to swing around? We also got a kick out of watching the "cord boy" (as we dubbed him) carefully manage the tautness and placement of the wire (quite successfully, I must say) during almost the entire show. I wonder, does he have an official title? What's his story? (Sorry for all the questions -- just the reporter's curiousity in me, I guess.) At any rate, thanks so much for your consideration, and I hope you'll be able to shed some light on my slightly odd inquiries.